Your Next Stamp is a new, fabulous stamp company. Check out their online store. 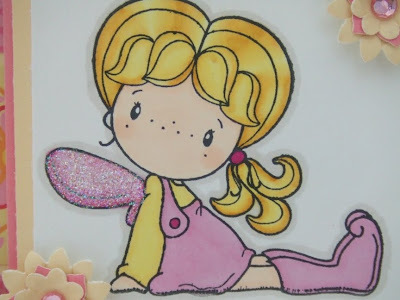 They have many fun and whimsical rubber stamps that are just gorgeous! I love this first card. It was quite a hard one to colour, because of all the detail. Promarkers have quite a large colouring tip, so when you have tiny detail to fill it can be a challenge! I'll bet you're on the design team aren't you? If not you will be soon as these cards are more perfection. I love the bib's on the first one and the flowers are breathtaking. just like your coloring. Love the card. and your second card is totally precious. Love those flowers too and the image. she's so stinkin' cute. And your layout of the card is fabulous!